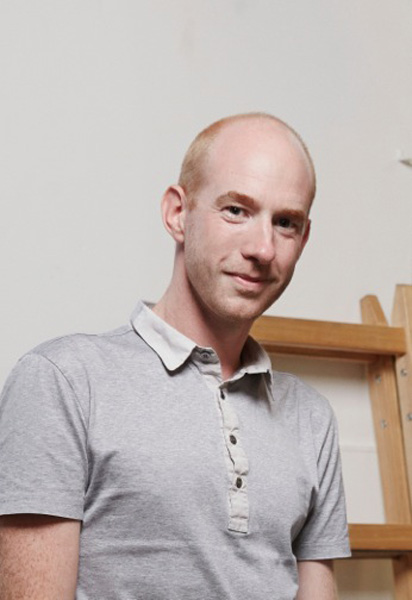 Andrew Walsh has extensive experience creating, directing and managing large-scale events throughout the world. 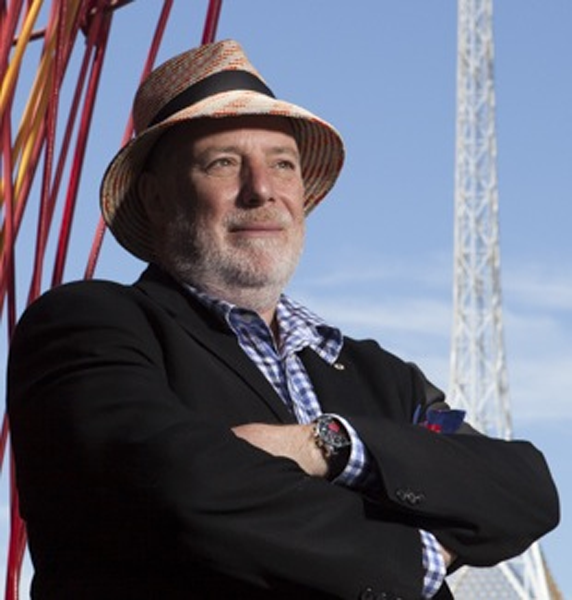 His career started in Melbourne in the 1970s and in 1988 he established Accolade event management. His list of accomplishments and roles in major events is large and varied. He was technical director for Australian Pavilions at three world expos, Director of Sydney’s Australia Day Spectacular for 14 years, Director of the London Millennium Celebrations and Creative Director of the Centennial Ceremony for Australia’s Centenary of Federation. In 2003 Andrew was Director of Ceremonies for Rugby World Cup, was the Executive Producer of the Opening and Closing Ceremonies of the Athens 2004 Olympic Games, Executive Producer and Creative Director of the Opening and Closing Ceremonies of the Melbourne Commonwealth Games 2006 and a return visit to Greece saw him produce the Opening and Closing Ceremonies for the Athens 2011 Special Olympic Games. 12-hour period from dusk to dawn. The inaugural event in 2013 drew more than 300,000 people to the centre of Melbourne. You're sitting in my comfy chair what is your favorite chair? More often than not I'm sitting on a plane in an airline’s comfy chair today it's Emirates first class (I got an upgrade) and having had a good sleep what better thing to do but write. My other favorite is an old armchair in the library at my farm where I can sit and look over the garden while listening to music. I'd like to mix you a relaxing drink what would that be? Coffee, tea, or maybe something stronger and why is it your favorite? Lately I’ve been drinking more tea although I still struggle to get a good cup in the myriad of coffee establishments that emerge from every nook and cranny. It seems to me one is presented with so much coffee choice: latte, latte-macchiato, espresso, cappuccino, Americano, free trade, fair trade organic, capsule, plunger, cold drip, on and on it goes. Ask for a pot of tea, more often that not, it comes in a pot that drips more on the table than is poured into your cup and has a tea bag hanging from the lid. Rant over. The other drink I like is a very traditional martini made from good quality gin with a hint of vermouth, shaken with lots of ice and an olive. The olive is a key ingredient not just an embellishment and should be chosen with care – firm and from good brine. The preparation, the shaking and serving should be ritualistic and the drink savored. Only one, mind you, well perhaps a second but that’s all. Oh. It seems that I was always interested in the making of art, theatre and music. As a kid I was always playing around with puppets, making things or listening to music. My parents encouraged my brother, sister and I to express our creativity. Although not great concert goers, arts consumers or makers, they were/are very interested in the arts and have an innate aesthetic and creative bent so, it was probably environment that started it off. Norman Kay taught me music and drama and was a strong influence at school and after I left, as were John Wregg and Nigel Triffit when I was very green. I don’t have formal training rather a degree in experience. I haven’t really done much else except some time working in radio and creating corporate events. I left school to work in and around the theatres of Melbourne, doing whatever jobs I could pick-up, which led to working on bigger shows and tours, then I worked at Ballet Victoria and the Rocky Horror Show, among others. I got a lot of good experience early on and that has lead me on a path to work on all sorts of interesting projects over the years. I’ve been very fortunate. How did you move from learning about events and theatre to world-class and major events? How do you learn about events and theatre? There are several very good schools that turn out well-rounded students but nothing beats doing the job, I advocate good education and training and the getting out there and doing the work. There is nothing like standing in the pouring rain at 4am watching the show start to float away. It focuses the mind on the task at hand – above all the show must go on! The major events business is not for the faint hearted, it can be tough and scary, but incredibly rewarding. The technology incorporated and the skills required mean that the people at the leading edge are constantly innovating and designing new ways to bring magic to life, day in and day out. You have to be on your toes, always open to new ideas and willing to take creative risks and believe in the show, yourself and the people around you. The career advice I would give is get a good tertiary education then get out there and do it, stay on your toes, and open your mind. Work hard. All of the above. The creative process is part inspiration, part innovation. Having a sound understanding of the objective and the audiences (there are usually more than one) and the space in which the project is to be staged is fundamental. Often it's about seeing the same thing as everybody else but thinking of something different. The process requires two distinct thought progressions; divergent – the ability to conjure up original, diverse and elaborate ideas and, convergent – the capacity to logically evaluate, critique and choose the most appropriate ideas for each project. If a project is going to work, on one hand the ideas have to be innovative and compelling, on the other they have to be understandable, deliverable and realistic. So it can be a little 'skit-so' at times. My process is to consult and to gain as much information as I can and then cook up the ideas from wherever and whenever they come. I can then work in collaboration with my delivery teams to make them happen. In the team process I work very openly, open to criticism and ideas equally. It’s important for a team to have ownership of the idea and eventually the show. It's not a one-man business or show, everybody in the team has their part to play and a voice at the table. Do you have a favorite genre: theatre, music, installations, art or something else? What inspires me is when I’m transported into a work. You know those moments, when your whole being is consumed by what you're looking at or listening to. I like visiting a work that feels like an old friend and at the same time I want to be challenged. So I don’t have a favorite form … I’m eclectic in how I engage with the creative world and the works I collect. I’m lucky it’s all mostly good; I get frustrated with people who lack vision and courage. The best is seeing an audience taken on a journey of discovery and magic. At the end of the day it's all about the audience, if they love it then I’m happy. The audience response. You know the other thing that really gives me a buzz is listening to and seeing young people devise and create exciting work. Just being around vibrant sharp minds is so inspiring. I do a little bit of teaching and intend to increase that not just for what I can impart to the students from my experience but also to be around inspired and bright young people. What are the highlights of your past projects and why are they special? For the Athens Olympic Games we created a ceremony that told the story of the Greeks down the ages, an 'Allegory' that took the audience on a journey through periods of Greek history. This spanned thousands of years and we used sculpture as a metaphor for the growth and evolution of Greek civilization and its contribution across the arts, sciences, politics and philosophy. The centaur, representing the duality of man as part intellectual, part physical, threw a javelin, which caused a giant Cycladic head, an object, which dates back to 2700 BC, to emerge dramatically from the lake we built that covered the center of the stadium. The Cycladic head then rose above the water's surface and broke into eight pieces, which traveled outward through the air to reveal the figure of a Kouros, a sculpted marble body from 500 BC. The Kouros then broke apart, this time to reveal a classical Greek statue from 400 BC. They all came to rest on the surface of the water representing the Greek Islands. Finally a male figure was revealed crouching on top of a perfect white cube, a symbol of the earth. The man stood and began walking, the cube twisting and rotating beneath his feet. This represented man's evolutionary journey to become a logical, spiritual being that was searching for knowledge. This was the most technically challenging moment in the history of ceremonies. We then went on to tell the story of the passing of time as depicted in a dream-like and colorful parade. Stylized figures from Greek frescoes, mosaics, sculptures and paintings were brought to life. This was a chronological procession atop a moving stage of images ranging from prehistoric to modern times. Ten scenes of mythology, discovery, history and culture culminated with a final scene featuring the first Olympic games of the modern era, Athens 1896. However, for me at least the most emotional moment in that vast production was a single pregnant woman, her belly glowing, and a thousand others standing in the lake as we revealed the DNA helix, the symbol of what makes us human, what makes as all the same, and at the same time all different. In Melbourne at the Commonwealth Games the approach was completely different. I didn’t want to tell a liner story of Australian history as this had been done brilliantly in Sydney only a few years before. Melbourne is a very confidant city with a very clear view of its place in the world, so drawing on that confidence, I decided to make up a story, a good yarn that would showcase the talents of the people of Melbourne and the City itself. The story was inspired by a poem by Michael Leunig. When working on the Rugby World Cup I had taken some of the ceremony out of the stadium to surrounding areas Sydney Harbor. That experience showed me that we could take large sections of the ceremony away from the arena and still provide the stadium and television audiences with a coherent and satisfying experience. At the same time we could create a show outside the stadium equal to the show inside. I wanted Melbourne itself to star in the show and for the people of Melbourne, unable to get tickets to the main event, to be a part of the opening ceremony. It’s estimated that 500,000 people lined the river to take part in the ceremony. So the ceremonies started by traveling down the Yarra River on a journey to the stadium. Highlights for me were the flying tram and the duck and the fish, 36 installations that dominated a kilometer of the Yarra River landscape between Princes Bridge and the Swan Street Bridge, all of which are still talked about today. If a show can become part of the collective story of a city then we have done out job. That’s a highlight for me. How did White Night Melbourne come to be? White Night Melbourne was inspired by the international Nuit Blanche festivals first staged in Paris, in 2002, in an attempt to bring culture and art to the masses in public spaces. At its core, Nuit Blanche is a 12-hour event with a mandate to make contemporary art accessible to large audiences, while inspiring dialogue and engaging the public to examine its significance and impact on public space. Approximately 24 global cities including Florence, Toronto, Buenos Aires, Tel-Aviv and Tokyo are producing similar all-night events. Ted Baillieu, then Premier of Victoria and Minister for the Arts, made an election commitment to bring White Night to Melbourne and entrusted the Victorian Major Events Company to conduct a tender process to stage the event. Bryn Skilbeck from Right Angle Events and I tendered as a joint venture between our respective companies and were appointed in October 2012. White Night Melbourne is both a “high art” event and a free, populous event that encourages celebration and community engagement from sunset to sunrise. It's a 'lived' experience for all who interact with it, from performers to audience to the businesses that make up the precincts in which takes place. The only question is how deep into the 12-hour journey of White Night Melbourne people choose to go. Unusual or forbidden spaces become sites of art and performance open for all-night discovery and rediscovery in a way never experienced before. 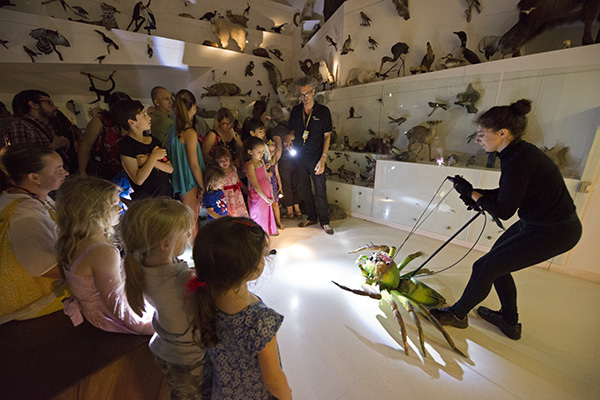 Cultural institutions, museums, galleries, and artist-run centers open their doors and offer free access to all. For one night the everyday will be suspended as Melbourne’s landscape is transformed to welcome a variety of artistic experiences. 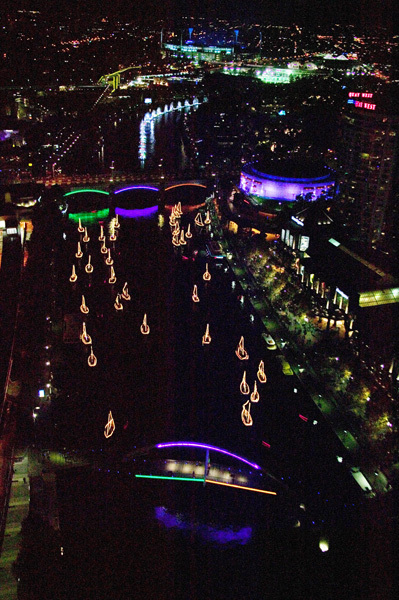 What will make White Night Melbourne fabulous in 2014? I can’t tell you that – not yet anyway. What I can say is that it will be staged over a larger footprint and incorporate more public and private institutions. At the moment we are in the middle of a submissions process to invite artists to submit work for consideration in 2014 and that’s always exciting. What I will say is expect the unexpected. 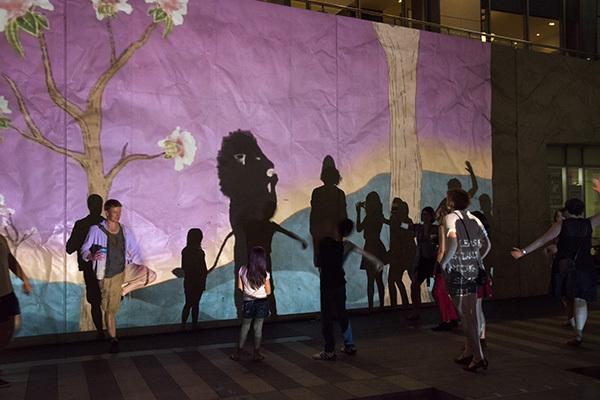 Oh and keep the 23rd of February free to be part of White Night Melbourne 2014. Written on flight EK 406 Athens to Melbourne via Dubai, 4 hours, 46 Minutes, 2974 miles from Melbourne at 39,000 feet. Andrew and I have been friends since we were young. We both attended a school that allowed for part-time study so that we could pursue our other interests. For me it was full-time ballet, for Andrew it was working in the theatre. There has been much water under our respective bridges since those days but I'm proud of what Andrew has achieved. He is one of the few people in the world today who can do what he does, and I'm not biased of course, but I think he's the best. Congratulations to the Victorian Major Events Company (responsible for White Night) for realising this too! 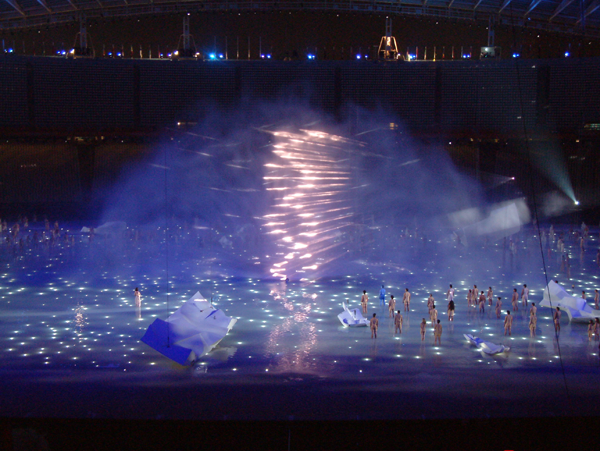 The water curtain and helix at the Athens Olympic Games 2004. Perspective of the Yarra River at the Commonwealth Games Melbourne 2006. Flying tram at the Commonwealth Games Melbourne 2006. The crowd at White Night 2013. Lighting effects from The Electric Canvas. Image courtesy of John Gollings and VMEC. White NIght 2013. Image courtesy of John Gollings and VMEC. White NIght 2013. Image courtesy of Dianna Snape.